Don’t be an accidental exporter! Too many companies start exporting by accident. International orders come in through your website or at trade shows, and they’re too big to ignore. And while fulfilling these orders seem simple enough, there are plenty of problems that can pop up at any time. Problems that could cost your company money and put you at odds with U.S. export regulations. A little planning can help you avoid these problems and dramatically increase the odds of your success overseas. 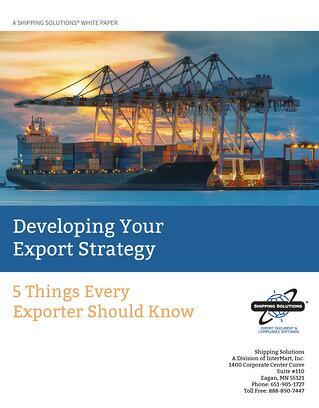 This free white paper helps you create an export strategy that will help you maximize your export profits and avoid common pitfalls. Review and understand export and import regulations. Prepare your goods for shipping. Make sure you get paid for your goods. Get started now by downloading this free white paper.